Arrow Sewing Cabinets: Time For A Little Spring Cleaning! Hello Everyone! In case you missed it, we went over 10,000 "likes" on Facebook and gave away a sewing suite last week. We're so excited for the next 10,000! To that end, we have decided to do a little spring cleaning and begin the registration process anew for all the giveaways we'll be doing until we reach 20,000 "likes". This means that anyone that registered in the past will need to sign up again by clicking on the purple "Sign Up for Our Giveaways" block located under our timeline photo on our Facebook page. If you're only able to check-in on a mobile device, visit this link instead: http://on.fb.me/XzJzcV This will also give you a chance to update your contact info so that we can reach you when you're a winner. And as we have done in the past, you will only need to register once - duplicate entries will be deleted*. In addition to our giveaway, we have more contests and fun planned during our journey to 20,000, so stay with us! Okay - registered - thanks so much for opportunity to win!!! I am loving my Gidget II! Thank you so much!! I don't have a cabinet but I do have one of your chairs! CONGRATULATIONS on reaching 10,500 "likes"!!! You are so assume! :)Thank you!! I've been registered since the beginning - maybe this will help me finally win something! I registered. I have a Gidget one but I really need a Gidget two for my big machine! I'm wondering if it would be possible for you to add the email notification possibility to your blog for those of us who prefer to recieve email updates each time you create a new post to your blog? It would be very helpful if you could. Thank you for considering it. Hi Vicki! We just added it, let us know if it works for you! Thanks, your giveaway is so awesome! I use a card table for sewing.Not to stable, but I'm hoping. Thanks for the opportunities you give us. I'm grateful. Signed up again.. Can't wait!! Thank you for letting us know we needed to re-register. You all have the best and greatest number of giveaways. How wonderful of you. Oh I really need one. Thank you for the contest. Good Luck to all of us. OH do I need nto Sping Clean. Due to health problems, I havn't been in my studio since last julyand I remeber it being a mess . I couldn't organize what was in there SUCH A MESS! So cute and I have the perfect spot. I am signing up again. Thanks. I would LOVE to win one of your swags! Thanks for the chance! I need to get organized. My sewing room is a disaster and don't know where to begin. so glad for the winner. would love to win and have a great new sewing surface. thanks for the giveaways! I hope I win. I just redone my sewing room. My daughter's bedroom is becoming my sewing/quilting room. I would love to win!! Gramacjcj from MN. This table would end my search for an alternative! Thank you for letting us know to re-register. Looking forward to have the chance for some fabulous prizes. Thanks for tell me to re-register. I need the table to help me organize my disaster of a sewing room. You are so kind to offer this for us. Thank you. This looks like a great table! I would LOVE to have one of those tables! Would love to win this table for my sewing room. I have recently gotten back into my quilting and am trying to organize my "stash" of fabric. One can never have enough sewing tables or storage!!!! 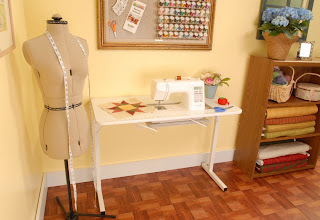 I really need a sewing table - thanks! I sure woul love a arrow sewing room!!! I keep wishing and hoping! That's a song, isn't it? Sure could use this. Thank you.